It all comes down to this week. 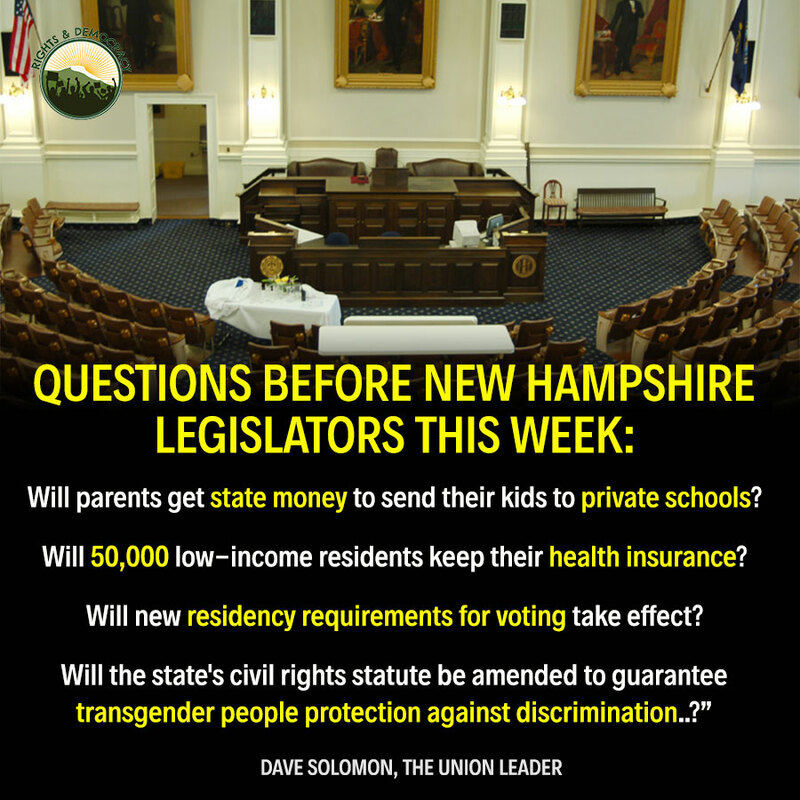 There are 4 very important votes happening in Concord in the next three days, and we need you to take action to ensure the health and civil liberties of Granite Staters are protected. The most important thing you can do is pick up the phone and make your position known. Call your representatives and urge them to vote YES on Medicaid Expansion. Attend the Rally to Reauthorize Medicaid Expansion on May 2 at 8 am at the State House in Concord. The full Senate votes on whether to pass HB 1319, updating NH law to protect transgender people from discrimination, on Wednesday, May 2nd. >Attend visibility rallies on May 2nd and May 3rd. Supporters are hoping this final gathering will be a victory rally. The full House votes on whether to allow school vouchers to fund private education (SB 193) Thursday, May 3rd. Call your representatives and urge them to vote NO on the School Voucher bill (SB 193). Subject line: The Reps are getting TONS of emails, so be sure to say something in the subject line that lets them know you oppose SB193 and why (just a quick “Don’t raise my taxes with SB193” or something – but make up your own so it doesn’t look canned.) And then the body of your email can be 1 or 2 sentences – no more is needed. Talking points are below. SB 193 downshifts $100 million in costs to towns/cities in the first 11 years, in ways they can’t make up with cost savings. Property taxes will rise. This bill takes public money and uses it for purposes beyond what the public agreed to, which was to fund public education accessible to all. The full Senate votes on HB 1264 on Wednesday, May 2. This is effectively a poll tax on voters because it requires them to establish residency and pay related licensing fees. Call your Senator and urge them to OPPOSE HB 1264.